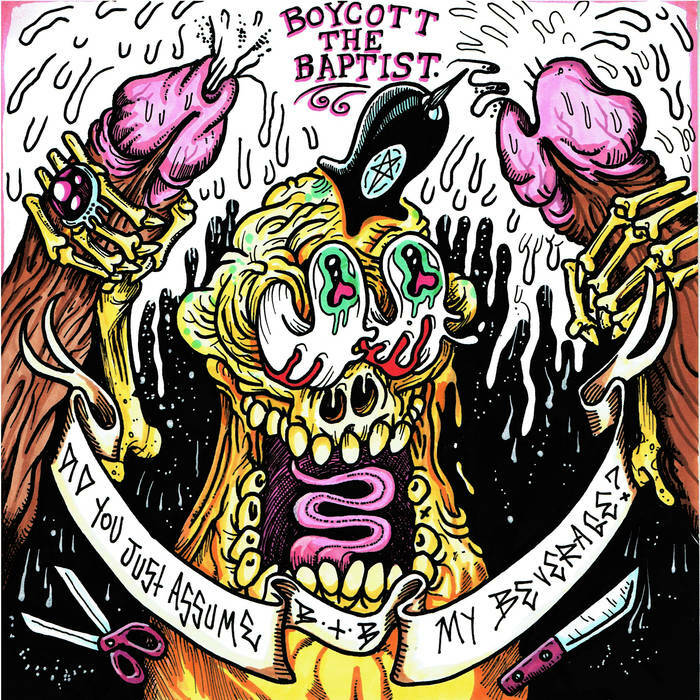 Before setting out to mix the latest Boycott The Baptist release ”Did you assume my beverage?” I went back and forth with the band if I should master or do a mix / master of the album. We agreed on me doing both mix and master. The tracks, recorded by Jake Berry, were sent to me to mix. I was given 7 drumtracks, 4 guitar tracks, several vocal tracks and a few sample / soundbit tracks. After loading everything in Cubase, I went through all tracks to see what’s there. By going through them I strated organising the parts and doing some routing like creating a drumbus, parallel compression buses and guitar and vocal buses. The 4 guitar tracks were 3 tracks of 1 guitarcabinet and 1 overdubtrack. Of those 3 tracks I ended up using 1 who had the most punch and grit. The problem with fast, grindcore type of drumming is that on occasion the speed needed affects the actual playing. In these recording, on fast bits, the played drumstrokes reduced a bit in intensity. At first, I tried with compression and volume levelling only to even out the balance. Unfortunately, this resulted in an uneven sound and artifacts as too much bleed of hihat coming through. So I looked for a few contant loud hits on both the kick- in and snare top tracks and selected about 5 snare hits and drumhits. These were layered under the recorded snare- and kickdrum by using the excellent cubase hitpoint to midi function and using Steinberg’s Groove Agent SE drumsampler and loading in these samples. The 5 samples were set to random exclusively to ensure the same sample doesn’t get played twice after eachother. the Groove Agent track was then bounced and reimported to make sure to have a constant sample track and not constant random samples. Although the selected snare and kick hits were pretty equal, the ever so small changes keeps everything sound alive. As said before, these sampletracks were layered with the original recording. This provided for a constant, even, and intense performance while the normal recording provided for all the little variations to keep a track alive and organic. Worked really well on this album. After checking out Boycott the Baptist’ previous album I noticed a sort of bassguitar on every track. This was not in the tracks send to me and after asking, it was mentioned a sort of synth was used on the previous album for that. So after careful listening I noticed it was actually a pitched down guitartrack of sorts. I felt that was really adding something to their previous album and I decided on doing the same on this one. Instead of simply using one of the guitar tracks and pitching it down I listened musically to were bassparts were needed and looked into both guitartracks for suitable parts and used those for the pitched down basstrack. With some editing and muting a basspart was created. This rounded out the instrumental sound and helped create the very heavy grindcore sound. The vocaltracks themselves were pretty roomy sounding. I added some slight gating and noise reduction to have a slightly more dry vocal to work with. The tracks and vocal performances varied from screaming in your face vocals to more acting or theatrical type of vocals which gave me lot’s of opportunities to work with effects and panning and get creative. This was a very fun album to mix. Check out the entire album in the bandcamp player on this page and visit the band’s facebook and bandcamp. Links provided below. They play a lot, make sure to check them out! And I got a track named after me. How cool is that?